Alaskim | Surviving Wildlife, Wildflowers & Wild-Haired Children: Where Are the Hot Tub and Wet Bar? Eighth-grade girls are all about their lockers. I don't understand it, since I didn't even have a locker in 8th grade, and in high school—when I was assigned a locker—I never thought once about decorating the metal cage where I kept my textbooks and wet boots. Oh, how times have changed. My daughter and her friends met up last week at registration, carefully selected their locker locations together, and set about decorating them. My daughter had actually sketched out a design plan for her storage space! This year's colors are blue and green, with a bubble motif. My locker is ready. I can rest easy. Yet one more difference between girls and boys, I guess! My eldest was very proud that although he was assigned a locker each year of high school he never once actually opened it. Boys are weird. We didn't have lockers in my high school. The general thought was that kids would hide drugs and weapons in them. So, without lockers, they kept that stuff more readily accessible in their backpacks instead. Right down to the shag carpeting. Times have indeed changed. It looks adorable, though. Well done. The one thing I did learn was to NEVER share your locker. UGH. Her locker looks great!! We didn't decorate our lockers either when I was in school! 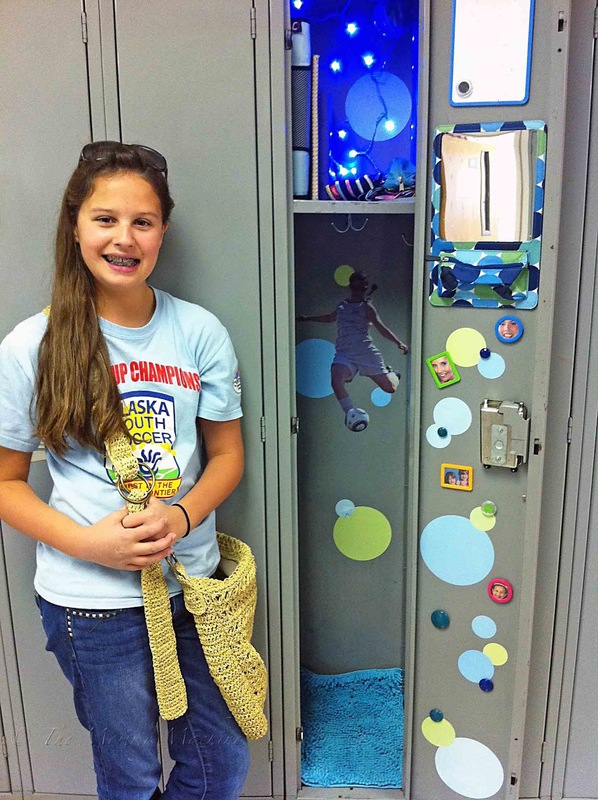 Her locker looks great! I love al the blue! You should link this post to my Back to School Traditions link up tomorrow! Very cute! We decorated our lockers in highschool too. We also shared lockers; that was huge. If your locker wasn't located on a "cool" floor you definitely found a friend that was and shared. My daughters are in 3rd and 4th grade and they have lockers but they didn't really decorate their lockers. I did buy them a locker kit that came with a shelf, mirror, and magnet pencil cup type thing. Thank you for sharing your post! Love the locker and the thought that went into it. My daughter is in 6th grade and also puts a lot of thought into her locker decor. She is a minimalist, though because she does not like to call attention to herself. She carefully selected a few items from Wal-mart to add to her "metal box"
They should totally have a locker "design off"! Aw, that's sweet. My 8th grader is awaiting her locker assignment and yes, she too has plans for decor. Funny. I think all I had up in my locker was posters of Tom Howell and Rob Lowe! My teenage hearthrobs! Her locker looks great!!! She's adorable too! what a milestone! I love it!! My daughter can't wait to have a locker! (she's in 4th) It's their own little space...i guess that's why they are so proud of it!